Here & Now resident chef Kathy Gunst says cabbage is inexpensive, good for you and can be used in a wide variety of ways. She brings three dishes for host Jeremy Hobson to try. Italy was a strange place for me to fall in love with cabbage. I never understood cabbage’s appeal until I traveled to Bologna in the early 1980s to take a cooking class with the late legendary cookbook author Marcella Hazan. She was explaining her culinary philosophy: that simplicity and sourcing the best, freshest ingredients are the secret to great food. On a slab of marble in front of her she placed a bottle of local red wine, a large, just-picked head of red cabbage and a bunch of pungent garlic. I remember thinking: “Cabbage? What? I came to Italy to learn to make pasta and tomato sauce, crusty bread and gelato.” Marcella sliced the cabbage thinly, placed it in a hot skillet with olive oil and garlic and then added nearly the entire bottle of wine. An hour or so later the room was filled with an earthy, sweet scent — I could have sworn there was meat cooking. We tasted the cabbage and marveled over its transformation into a thick, red wine-laced stew. It didn’t seem possible: Three simple ingredients, one magical dish. Now, three decades later, cabbage’s reputation has been transformed from peasant fare to superfood. It’s the new kale. And if you believe everything you read about the health benefits of this brassica, you should be eating it every day. For a start, it’s high in vitamins A, B, C and K, full of fiber, iron and potassium and said to have cancer-preventing benefits. If that isn’t enough, it ranks as the vegetable with the fewest amount of calories or fat (at a mere 25 calories per 3.5 ounces.) Oh, and it’s cheap. Cabbage is extremely versatile. You can use it in stir fries, sautés and braises, with meat, poultry, fish or all on its own — think corned beef, sauerkraut, kimchi, coleslaw, soups, braises, raw, pickled and more. You can stuff the leaves or use them raw as a natural container for sautéed vegetables or meat. Green cabbage is the most basic and common of cabbages. Use it in salads and slaws, stir-fry it, or slow-cook it in soups and stews to bring out its essential sweet nature. Look for heads that feel heavy for their size (which can range from softball to almost basketball size,) with tightly packed, moist looking leaves. 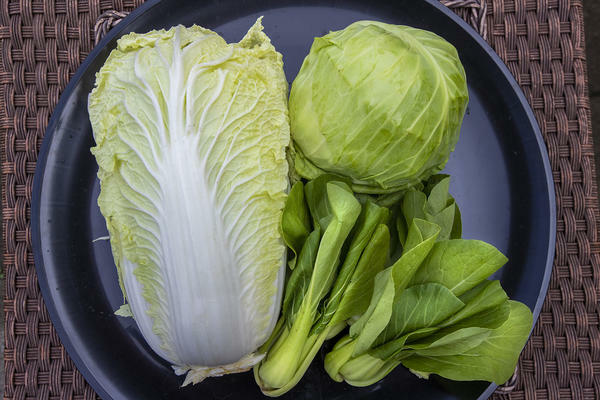 Green cabbage can be used raw in slaws and salads and holds up to all kinds of assertive, strong flavors. Red cabbage looks like green cabbage except, well, it’s red. Red cabbage heads tend to be a bit smaller than the green ones but look for tightly packed, moist-looking leaves and heads that feel heavy. Red cabbage is delicious thinly sliced in salads like slaws or can easily be cooked. The rich color of red cabbage offers a concentration of anthocyanin polyphenols, as well as antioxidants and contain anti-inflammatory properties. Savoy cabbage is also known as curly cabbage. With ruffled, lacy, deeply ridged leaves, these cabbages are gorgeous and tasty. The tender leaves tend to be more loosely layered and less tightly packed than green or red cabbage, although it can be used in much the same way — raw in salads, stir-fried, braised or added to soups and stews. Because the leaves are so tender you can use this cabbage a wrap for rice dishes or stir fried meat. Napa cabbage, also called Chinese cabbage or celery cabbage, has a different look than other cabbages. It has long light-green leaves and white stalks that appears more lettuce-like with a mild flavor that has a bit of a spicy, almost peppery kick at the end. Great for pickles, kimchi, stir fries and salads. Bok Choy has a mild flavor most often used in stir fries, but is delicious braised and used in simple preparations. The cabbage flavor is subtle. Cabbage will keep best refrigerated, and should last you several weeks. This is my adaptation of an old Marcella Hazan recipe that combines red wine and cabbage. Here, you slowly braise a chicken and thin slices of red cabbage — the cabbage kind of melts into the dish — creating a perfect, comforting winter meal. Serve with rice, egg noodles, potatoes or crusty bread to sop up the juices. Place the flour on a plate and season liberally with salt and pepper. Dredge the chicken pieces in the seasoned flour. In a large casserole dish, heat 1 tablespoon of the canola oil over moderately high heat. Brown the chicken pieces on both sides, about 5 minutes. Remove to a clean plate and continue, adding the additional tablespoon canola oil if needed. Remove all but 1 tablespoon oil from the pan and add the olive oil and place over low heat. Add the onions, garlic, salt, pepper and thyme and cook, stirring occasionally for 10 minutes. Add the cabbage and stir to mix everything; cook 10 minutes. Add the browned chicken pieces skin side up in one layer if possible and add the wine. Raise the heat to high and bring to a boil. Reduce the heat, cover, and cook 40 to 50 minutes, stirring once or twice and turning the chicken over once during the cooking time. The chicken should be quite tender. Season to taste and serve hot sprinkled with the parsley. In this French-style soup, cabbage, sausage and root vegetables simmer together to make a comforting and healthy meal. Serve with grated Parmesan cheese on the side. Like most soups, the flavors are even better if it’s made a day ahead. The soup can be made, covered and refrigerated up to three days before serving. Serves 8. Heat 1 tablespoon of oil in a large soup pot over medium-high heat. Add the sausage and cook, stirring frequently, until well browned, about 10 minutes. Remove with a slotted spoon to a paper towel to drain. Reduce heat to medium and add the remaining 1 tablespoon oil, along with the onion, garlic, salt and pepper; cook, stirring, until starting to soften, 2 to 3 minutes. Add carrots, turnips, celery root and potato and cook, stirring once or twice, until starting to get tender, 4 to 5 minutes. Add cabbage; cook until starting to wilt, about 2 minutes. Return the sausage to the pot and stir in broth, wine, tomato, rosemary and thyme. Increase heat to high and bring to a boil. Reduce heat to maintain a simmer, cover and cook for 1 hour. Uncover and simmer for 15 minutes to reduce the broth and intensify the flavor of the soup. Taste and add more salt and pepper if desired. Serve topped with the grated Parmesan and parsley. This quick, easy dish makes a light, healthy main course served with brown or white rice, or makes an excellent side dish to any roasted or steamed fish or meat. Place the trimmed bok choy into a steamer tray over 2 inches of boiling water and steam for 2 minutes. Remove and rinse under gentle cold water; drain again. In a wok or large heavy skillet, heat the oil over high heat. Add the chopped slices of ginger and cook, stirring, for 30 seconds. Add the bok choy and cook, stirring, for about 3 to 5 minutes, depending on the size of the bok choy. Small, tender bok choy will cook quickly; you want it to be soft but not limp. When you cut into the bok choy it should still have a snap. Place about a tablespoon or two of hoisin sauce on a medium serving plate and smear it across the plate, using the back of a kitchen spoon. Place the cooked bok choy on top of the hoisin and serve hot.